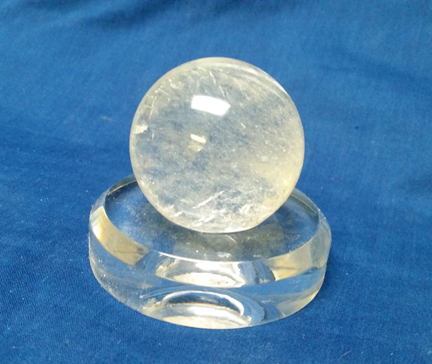 Polished Quartz Spheres range about 1.5" in diameter, and range in price from $10 to $24. Medium range from 2" to 2.5" and range in price from $25 to $49. Large size range approx. 2.5" to 3" diameter. Price range from $50 to $79 each. NEW! 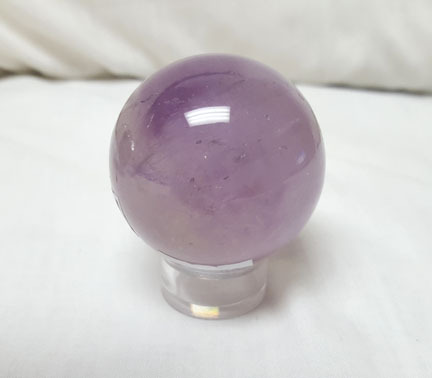 We now have Extra Large Polished Quartz Spheres which range in size from 3" to 4" in diameter and are priced between $80 and $110. We have Extra Small in stock! $5-$9-limited supply! 1"-1.25"
We know your customers will love these very attractive 50mm Snowflake Obsidian Spheres. These beauties are black in color with snowflake flecks of greyish white. Approximately 2" in diameter. Direct from China comes these very attractive Tree agate spheres. Generally they are predominately white in color with flecks of green. Approximately 2" in diameter. Direct from Brazil comes these very attractive Hematite Spheres. Generally they are silvery black in color. Approximately 2" in diameter. 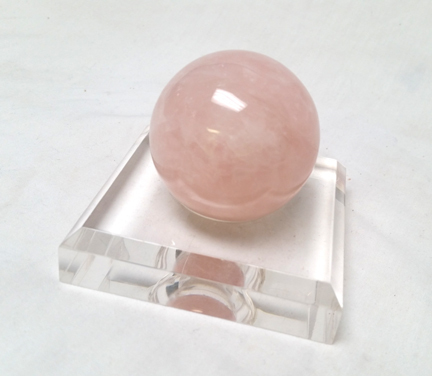 This gorgeous Rose Quartz Stone is from China. The spheres measure 50mm (2") in diameter. 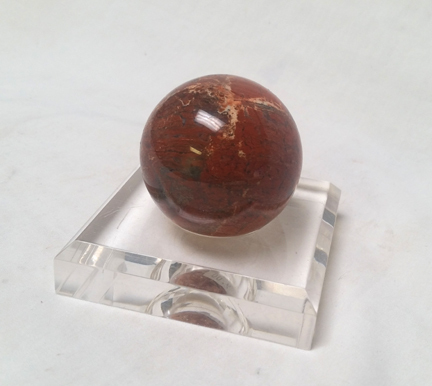 This type of Red Jasper is often called "Poppy Jasper" This sphere measures 2" in diameter. Smoky Quartz is a grey, translucent variety of quartz. It ranges in clarity from almost complete transparency to a brownish-gray crystal that is almost opaque. Some can also be black. The smoky color results from free silicon, formed from the silicon dioxide by natural irradiation. 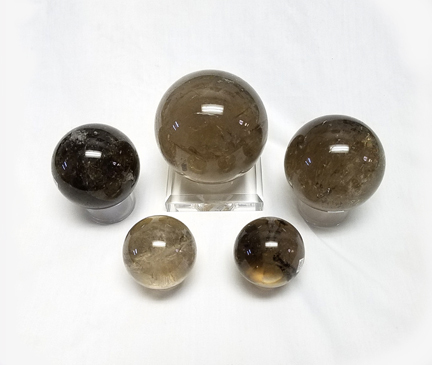 These gorgeous Smoky Quartz Spheres are a beautiful addition to our growing selection of polished minerals. This product is priced by weight so size will vary. Supply is limited. Sorry, no backorders. 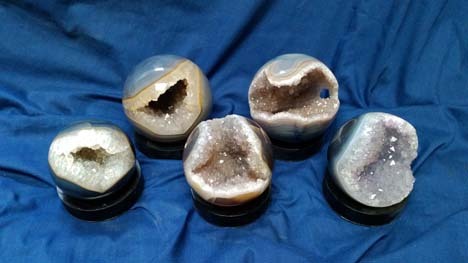 These beautiful polished Geode Spheres come in a variety of sizes and colors. Each piece is priced by weight and quantities are VERY limited! Sizes are approximately 1.5" to 6.5" in diameter, with the 1.5" being in the $25.00 range. GET THESE VERY SPECIAL DISPLAY PIECES TODAY! Sold by each. NEW PRICE RANGES!!! Stand not included. These gorgeous Polished Amethyst Spheres are cut and shaped from Brazilian Amethyst. They range in color from pale lavender to a deep, smoky purple. Amethyst has potent metaphysical properties for spiritual healing & bring intense spiritual growth. It is the February's birthstone as well as 6th anniversary gemstone.